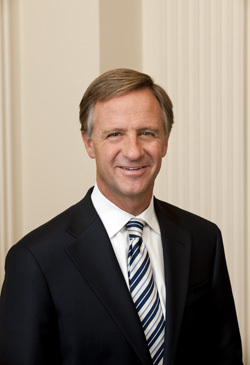 According to a poll released in January, Bill Haslam has a 68% approval rating in Tennessee. Elected as a moderate, the words out of the Governor’s mouth certainly don’t lead anyone to believe he’s a firebrand. Of course, word and deed are two different things. The truth is, Gov. Haslam’s positions further a system of government that focuses on helping those who don’t need it rather than helping those who do. If you have had access to things like healthcare, education, and capital among others throughout your life, its fairly simple to rationalize that people who lack access, do so out of choice rather than necessity or circumstance. Further, it is easy to rationalize that people are choosing to be personally irresponsible rather than circumstances getting in the way. Circumstances for someone who’s had all his worldly needs taken care of their whole life are just excuses, right? From there, its a short trip to they don’t deserve help, which is the position of the GOP generally. They don’t believe that circumstance has anything to do with outcomes. They believe that if you’re not doing well, its because of something you did or didn’t do. Of course, the reality is very different from this belief. And while Gov. Haslam’s commitment to this belief may not be as strong as other members of his party, its there, just obscured in his mushy language and by those firebrands who trumpet it from the highest mountains. The most obvious example of this idea is found in the Tennessee General Assembly’s GOP caucus. To hear some in that august body tell it, folks that aren’t making it just aren’t trying hard enough. Rep. Casada’s “Just get a job”, statement from the 2010 session is one of the better examples, though the just killed Oliver Twist Act comes in a close second, if only because the GOP Senate caucus itself understood the bill would show too much of the this belief to the general public. To be honest, the list of outrageously ridiculous bills are too many to mention. But they do give the Governor something he desperately needs…cover to do things administratively…in the background…that ultimately accomplish the very things the legislature seeks to achieve. While the Governor isn’t being held accountable for the actions of the legislature, he also hasn’t chosen to take a stand on issues that don’t match up to his moderate image. The public has largely given him a pass on the more radical ideals that have come up…and by extension, that pass has included measures that he actually supports. The sum total of Gov. Haslam’s legislative victories include the recently passed Workers Comp Bill which will only hurt workers, a bill that weakens teacher unions, and by extension, makes teaching a much less attractive profession, passed tort reform which was supposed to be a huge job creator, but really just “put a price on the life of the weak”, as Eric Stewart put it, put an end to the inheritance tax by 2016 which only impacted 900 people a year, and worked to reduce the impact of the Hall Tax on investment income through bills SB980 and SB0198. None of these bills mean a hill of beans to regular people in this state. Haslam even, at first rejected calls by Democrats to lower the sales tax on food before including it in his legislative package this term. So while companies and the wealthy saw their taxes and potential liability drop by thousands of dollars each, us folks down here at the bottom get to see a $3.65/yr. tax cut in sales tax on food…which at best will buy you a frozen burrito at your local “Quick Stop”. That is supposed to be “moderate governance”. Both the legislative victories, and foil legislation, mean to distract people from real policy changes that are occurring in the agencies the Governor’s office has direct control over. Over the past two years, the Governor has taken steps to tighten requirements for people that receive state services, without input or direction from the legislature. This effort hasn’t been reported on in the media. In fact, there are few who even know about it outside of providers. But it is happening, and the pinch is on those who need these services to, in some cases, survive. This is all done in the service of “efficiency”. Unfortunately, efficiency really means making it as hard as legally possible for people to receive services they qualify for, which is a big part of the reason there are 98,000+ people who qualify for TennCare, but aren’t on the rolls. They are being turned away on technicalities, artificial barriers, rather than reality. Damn the consequences. In the process, many of them are racking up huge hospital bills that lead to bankruptcies, or uncompensated care that puts the viability of hospitals in danger. That’s not efficiency, its slow suicide. 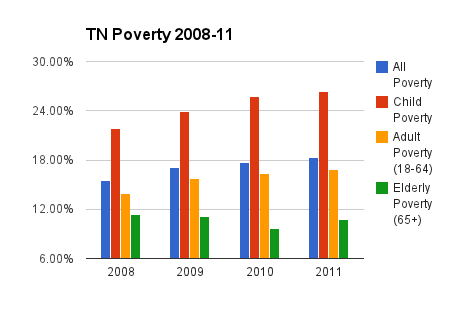 While the poverty rate in Tennessee started climbing in 2008 due to the financial crisis, little has been done on the state side to help people ensnared in the bad decisions that brought the crisis on. You might think that falls on the Federal government, but because Tennessee basically runs all Federal social services through block grants, it is incumbent on the state to both apply for additional grant funds and budget for these things. That hasn’t happened at all. In fact, every agency other than education was asked to cut 5% from their budget at the direction of Gov. Haslam last year. That 5% may not seem like much, but when you consider many of those dollars are matched one for one (or more) by Federal dollars, it adds up quickly and to much more than 5%. As for attracting jobs, the only job creation bill Gov. Haslam has passed is tort reform, mentioned above, which is actually associated with slower job growth. In fact, every bill supported by the Governor, with the exception of the Democratic sponsored cuts to the sales tax, does nothing to help create jobs or give Tennesseans a leg up to bettering their circumstances. All of them help wealthier people save money, which has never created a single job ever. And so, I circle back to the beginning. The reality for the 2.6m people Tennesseans who are either in poverty, or one month of earnings away from poverty, and the 2.2m more people who might make it through two or three months without earnings before they lose everything, this Governor has done absolutely nothing to benefit you at all. That’s 75% of the state’s population. Nothing. And while Gov. Haslam may currently enjoy a 68% approval rating for now, that goodwill will be short lived if conditions don’t change rapidly. Based on his actions thus far, things will only get worse because he hasn’t done anything but support pennies of annual tax savings for most Tennesseans when he could have been investing in their future. Because in the end, Gov. Haslam and his GOP friends in the legislature believe that if you aren’t making it, its not because of your circumstances, or bankers that tanked the financial system, or laws that actually slow job growth when they’ve been billed as job creators…its because of something you did to yourself. So much for being a moderate.